Each year, Hailey becomes obsessed with some boy. Last year it was Phillip. This year it was Max. At the end of the school year, Hailey kept asking me for a play date with Max. Now, her class is pretty big and there's a drop off and a pick up line so you don't really get to go in and put faces with names so I had no idea who Max was. Add to that that Hailey kept telling me that Max wasn't in her class but in the other class and I now have almost 60 kids to wade through and figure out who Max is. 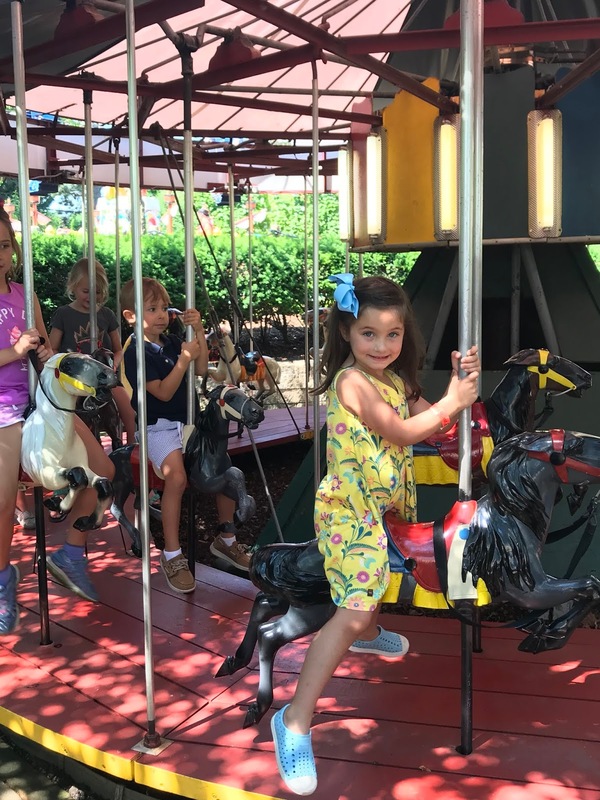 I mean how can I deny my youngest from having a play date with someone considering she never asks for them and the only time she does, she wants boys to play with her. So I did the only thing I could and I went straight to the directory which I had squirreled away at the beginning of the school year. I found two kids named Max in that class but they lived in different towns so I put Hailey on a mission. Ask Max what town he lives in or what his last name is. 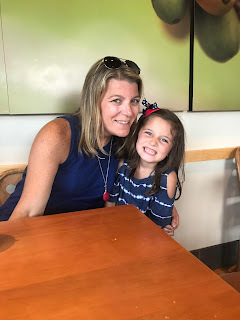 She did her homework and I was able to figure out which Max and that I had met the mom before as I thought she worked at the school at one time. I emailed her for a play date and she did one better and invited Hailey to Max's birthday party this summer. 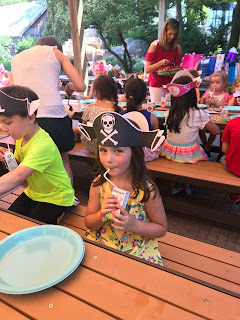 Now, I had to leave a World Cup party early to drive Hailey to Pirate's Cove amusement park for this birthday party but Hailey was so excited that I was excited for her to see Max again. 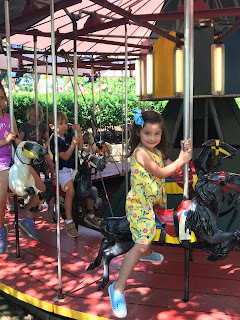 To say she had a great time is an understatement. She kept following poor Max around but Max didn't seem to mind. He happily obliged to playing with her and I could see why they were thick as thieves at school too. So you make the decision - Hailey's BF as in best friend or BF as in boyfriend? I for one think they make a cute couple! 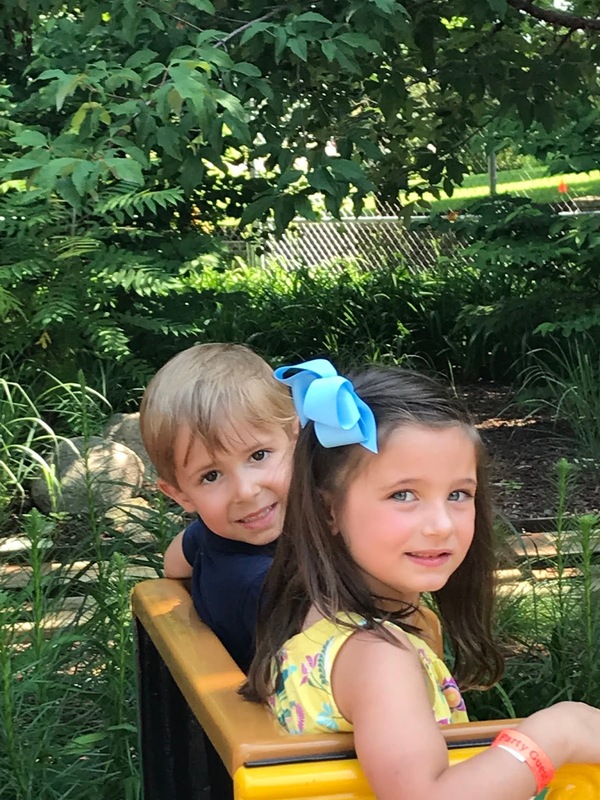 When should I break it to her that he won't be going to her school next year as he's a few months older and off to kindergarten?! 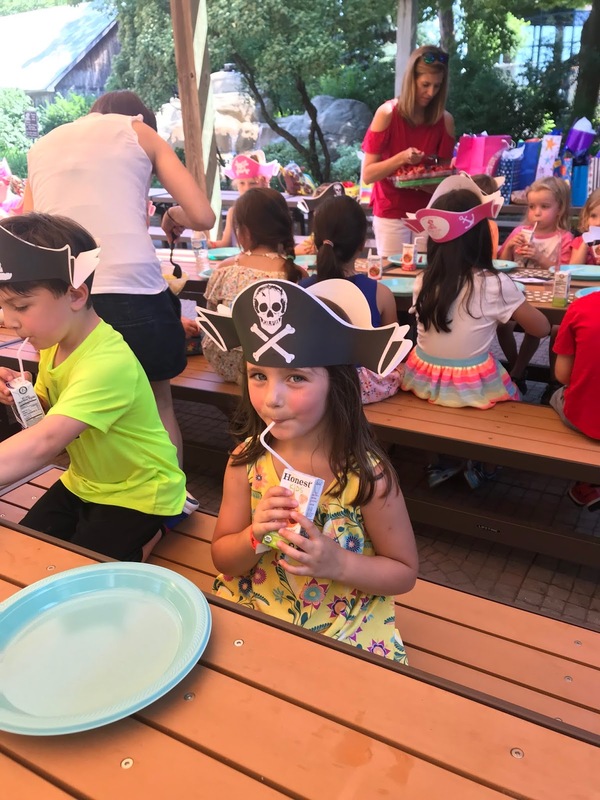 It was a pirate party! It was a quiet week without Peyton. 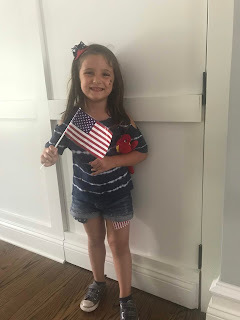 There was no screaming, little to no fighting and certainly no temper tantrums!Those were all short lived pretty much 24 hours after we picked her up from her first sleep away camp. The day before we picked her up, we received a post card from her that said she loved her counselors and she wanted to go for two weeks next year. But the first thing she says when she sees me is I was wrong in my letter, I only want to go for one next year! Ha! I think it was a good week for her where she had to be away from me and foster some independence. She had to be responsible for her own stuff all week and have it packed up when we arrived. She did a really good job at that and the move out was quick. She looked good but her hair might've looked like she hadn't brushed it all week and I'm not quite sure she showered more than once (but she said she went swimming and in the lake so that should count as bathing!). I got a huge care package from my parents which I barely shared/used. But, I did use my money at the camp store to buy two stuffed animals because I certainly needed more of those. I made a good friend, Alexis, who lives about 10 minutes away from us but I didn't get her address or phone number. Maybe I'll see her around town. I'll think about it. Maybe. It was a long week of camp and dare I say I missed her? I did. 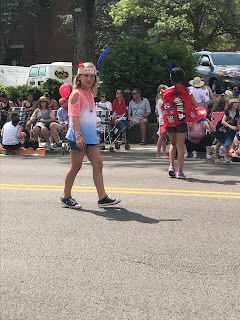 I'm not sure she'll go back next year and if she does go to a sleep away camp, I'm thinking it will have air conditioning, less bugs, better food and be a bit shorter than a week for her. 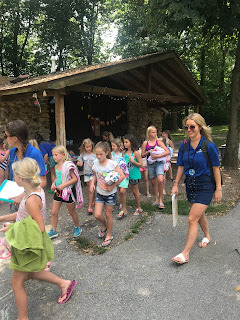 Last week marked the start of summer sleep away camp for my kids. 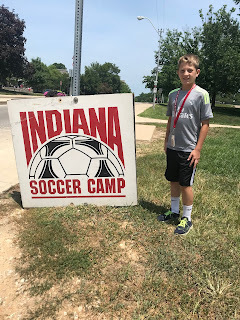 Austen's camp started first so I packed him up and trekked him all the way to Bloomington, Indiana, where I spent nearly four years of my late teens and early twenties. I was so excited for him to attend IU's soccer camp - mainly because I love visiting IU and secondly, because I'm secretly hoping that one of my three kids will attend college there so I have an excuse to keep going back! Once we arrived back in Bloomington, we really got to explore how much the campus has changed since I went there more than 20 years ago. It's amazing! We found a great outdoor brewery for Friday night's dinner and then found some ice cream and walked around Bloomington with Peyton and Hailey. Saturday morning we strolled on the new B-line trail to the local farmers market, which was amazing. 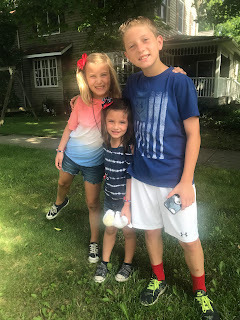 We picked up some local corn and then took a stroll through campus before Tom took the girls to the local pool to beat the heat. Meanwhile, I met up with an old college friend for a drink. It was so nice to catch up and to do so in our old college town. Later, I met back up with Tom and the girls and we went to a farm to table restaurant for dinner and then my old friend had recommended this baked to order cookie place for dessert where Tom and Hailey sampled their ice cream sandwich cookies. Yum! 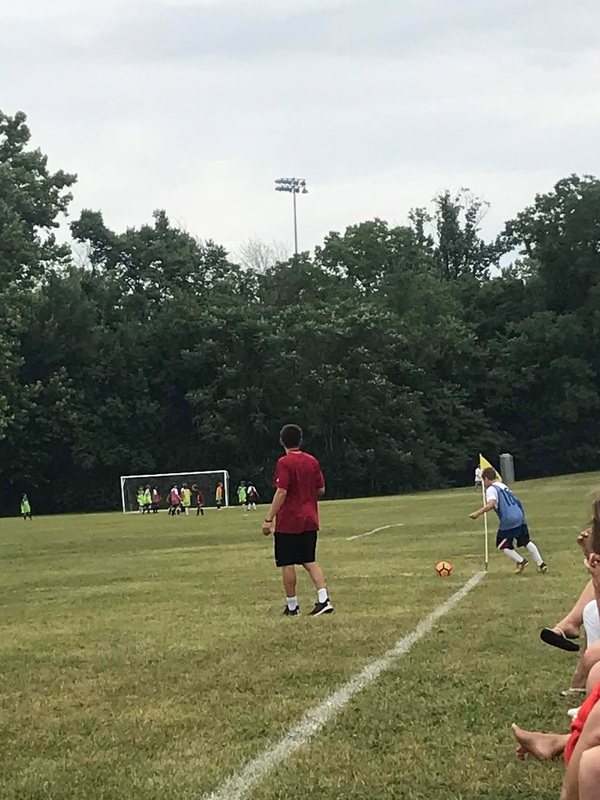 Sunday, we woke up early to see Austen play some of his last soccer games at camp. And although exhausted and sore, he had a great time and told us he wished camp was longer. That's a good sign! 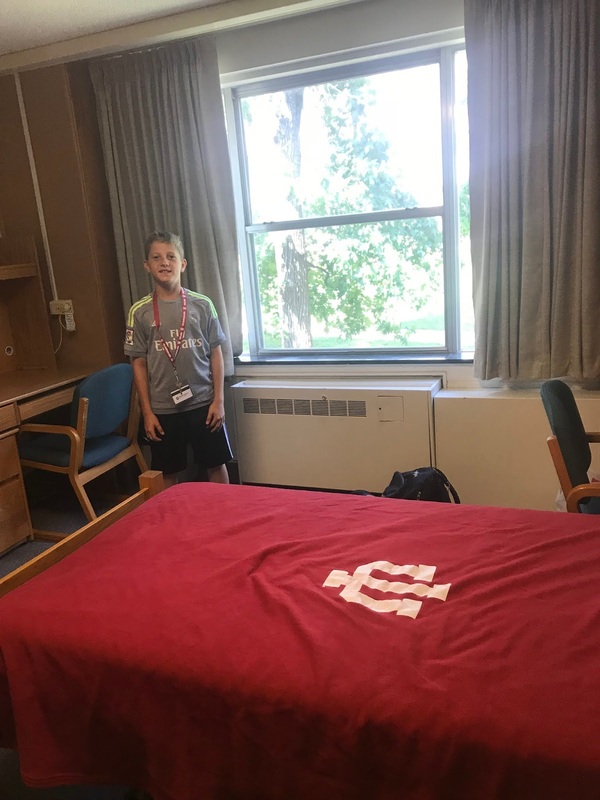 He can't wait to go back next year (and I can't wait to take him!). After taking in the World Cup final at a local restaurant (with Elk burgers), we drove about halfway home and dropped Peyton off at her sleep away camp. (That worked out really well!) She was so excited to go that she barely said goodbye to me. 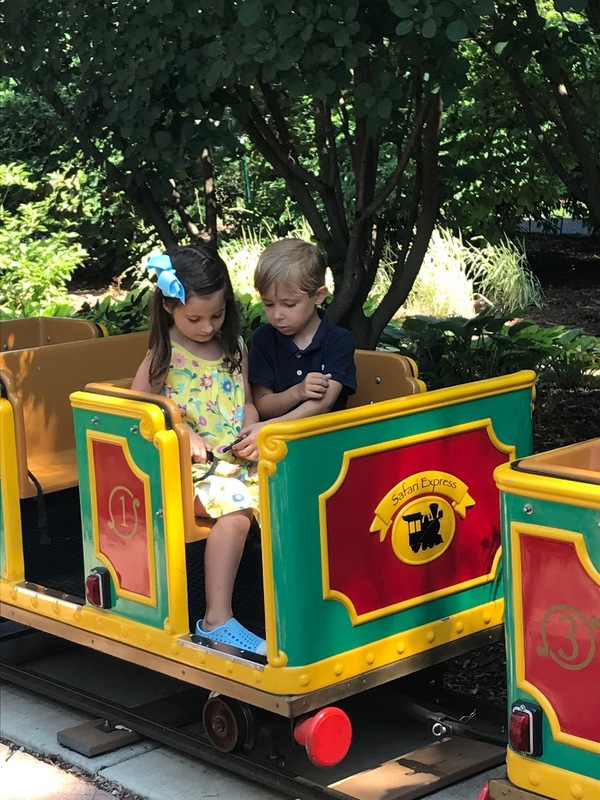 She couldn't wait to get to know her new friends and her counselors (she did go with one friend she knew). Before departing, I left her many letters and a big care package at the camp post office to be delivered that I know she's going to love. I wish I could see her face when she opens her giant package tomorrow stuffed with gum, lollipops, a stuffed animal, light up balloons and bracelets, tattoos and more! I bet she has the best time, and like Austen I bet she's sad when it's time to come home. 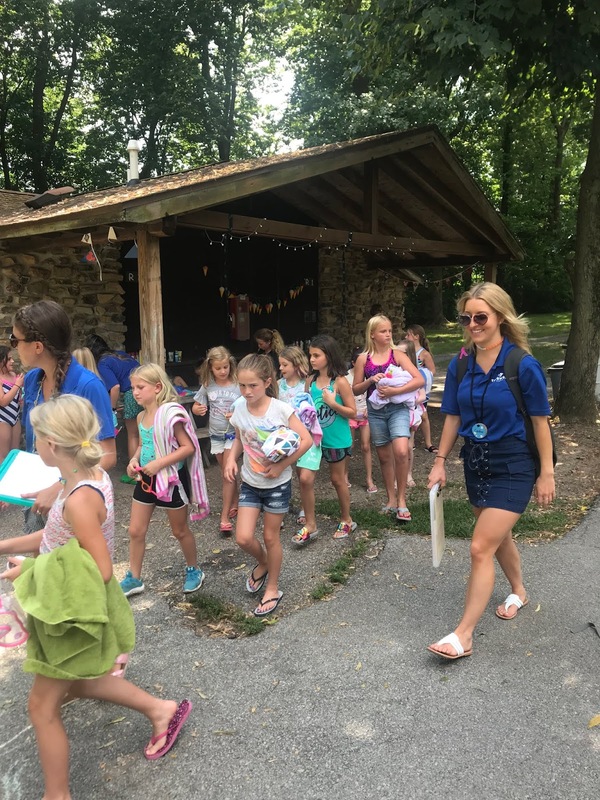 That's the kind of experience that every parent wants their kid to have at sleep away camp. It's the best! He's arrived and ready to go! And, I belong here too! And, Peyton is off! Barely even looking at me to say goodbye! 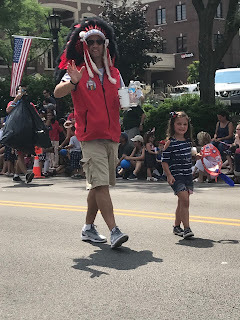 4th of July was a hot one this year and likely the last time we'll attend our local parade and I can't say I'm sad about that one. 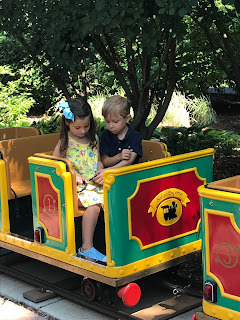 It was so hot this year that Austen and I had to take multiple breaks to go stand in the shade or I swear we would have melted right there on the spot. 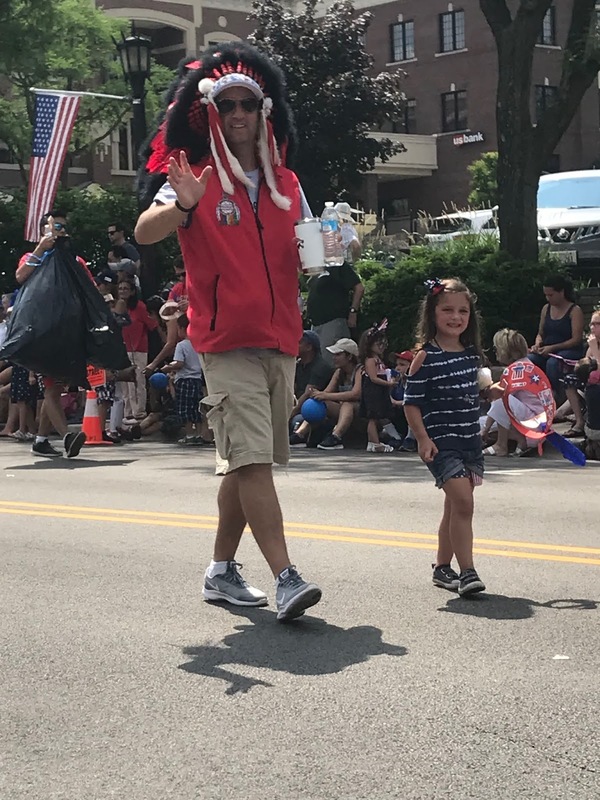 Couple that with the fact that our whole family hasn't watched the parade together in about four years and you kind of ask yourself what's the point! The last three years, Peyton and Tom (and Hailey the last two) have walked in it as part of the Indian Princess group and the year before Austen had an all star baseball game so I took the girls. Anyway, next year is a time to start new traditions up at our beach house in Michigan. More on that in future posts. Tatoos and all! Check out those stars and stripes pockets! Well at least Hailey was smiling...or maybe she was laughing at the funny headdress Tom had to wear as the future chief of Indian Princesses! Starbucks break! Nice and cool! I don't care what you do but you're going to do something is the refrain that comes out of my mouth most often when it comes to Peyton. 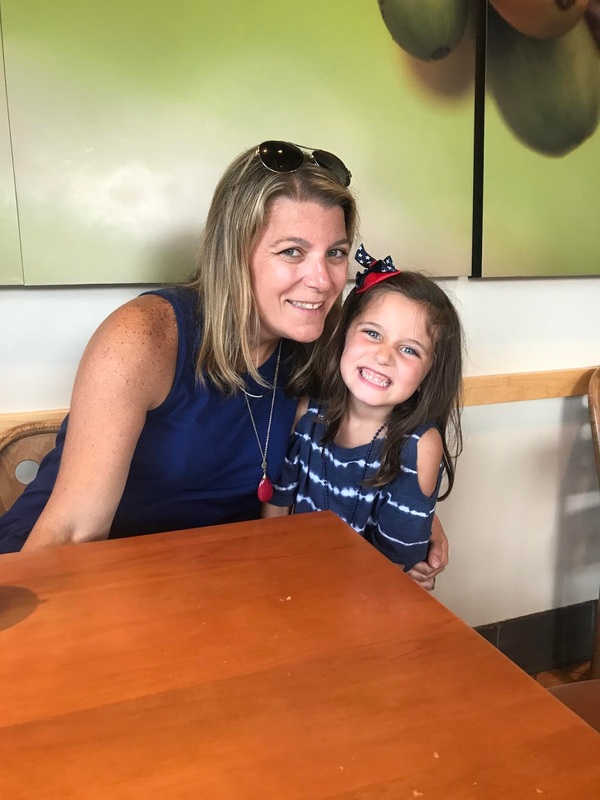 So when she passed out of all of her swim lessons in January but yet I didn't feel like she was very confident in the water, I suggested she try her hand at our pool's swim team. To make the team you had to swim one length of the pool doing freestyle and the other length doing backstroke. Now I was pretty confident she could do this and she does have a beautiful stroke so it was no surprise when she made the team. But the true surprise was when they held their "mock" meet to decide who would be on the "A" team and who would be on the "B" team. I had heard that most kids who aren't on it the year before make the "B" team and Peyton was okay with this as she thought she'd win more races aka ribbons this way, but she killed it during the mock meet for times and got placed on the "A" team. And, the "A" team is where she should be because she's still killing it with her freestyle and backstroke and she's working hard to improve her breast stroke and butterfly which has come a long way. 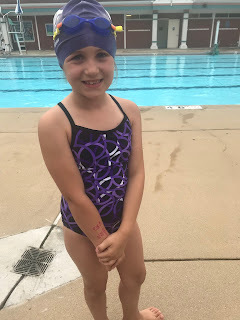 She goes to practice every morning without complaint for an hour (you really only have to go 3 times a week but she goes 5) and she's become way more confident in the deep water. In fact, at her first meet she noticed that where she had to dive in from was 12 1/2 feet. I thought she'd quit then but she didn't! Did I find the sport that she'll stick with yet? Maybe! But when I asked her if she wanted to do swim team next year, she says, "No, I'm good. Just this year." That elicited a big sigh from me. Here she is killing it in her freestyle medley race with her teammates.